Since its original publication nine years ago, Leadership and Self-Deception has become an international word-of-mouth phenomenon. Rather than tapering off, it has sold more copies each year since 2004 than it did in any of the first four years after publication. The book’s central insight—that the key to leadership lays not in what we do, but in who we are—has proved to have powerful resonances not only for organizational leadership, but in readers’ personal lives as well. This new edition has been revised throughout to make the story more readable and compelling. And drawing on the extensive correspondence the authors have received over the years they have added a section that outlines the many ways that readers have been using Leadership and Self-Deception, focusing on five specific areas: hiring, teambuilding, conflict resolution, accountability, and personal growth and development. 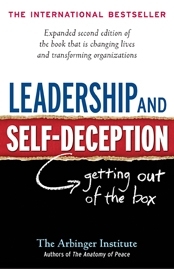 Leadership and Self-Deception uses an entertaining story about an executive facing challenges at work and at home to expose the subtle psychological processes that conceal our true motivations and intentions from us and trap us in a “box” of endless self-justification—even when we’re convinced we’re doing the right thing. Most importantly, the book shows us the way out. Readers will discover what millions already have—how to consistently tap into and act on their innate sense of what’s right, dramatically improving all of their relationships. The Five Temptations of a CEO points out five valid temptations, but it overlooks the most seductive temptation of them all: the temptation to shut your eyes to your own faults. Leadership and Self-Deception walks you through the emotional journey of learning to see your own faults, a vital prerequisite for change and transformation. Similarly, Why We Make Mistakes points out many different reasons human beings fall into error, but doesn't force you into that introspection that will help you avoid making those errors in the future. Leadership and Self Deception uses storytelling to show you how to take the blinders off your own vision. Finally, books like The Goal teach you how to focus on your organization's weakest link, but forget to include anything about finding the weak link within yourself. This is why Leadership and Self-Deception is an invaluable, unique book and a consistent best seller. The Five Temptations of a CEO points out five valid temptations, but it overlooks the most seductive temptation of them all: the temptation to shut your eyes to your own faults. Leadership and Self-Deception walks you through the emotional journey of learning to see your own faults, a vital prerequisite for change and transformation. Similarly, Why We Make Mistakes points out many different reasons human beings fall into error, but doesn't force you into that introspection that will help you avoid making those errors in the future. Leadership and Self Deception uses storytelling to show you how to take the blinders off your own vision. Finally, books like The Goal teach you how to focus on your organization's weakest link, but forget to include anything about finding the weak link within yourself. This is why Leadership and Self-Deception is an invaluable, unique book and a consistent best seller.